One day, your latest gadget won’t be in your pocket like a phone or even wrapped around your wrist like a smartwatch, but stuck to your skin like a transparent plaster. Researchers at the University of Tokyo are the latest group to attempt to make this kind of “ optoelectronic skin ”, with an ultra-thin, flexible LED display that can be worn on the back of your hand. What makes this possible is the field of “organic electronics”, which can also be used to create a range of technologies from printed solar cells to computer screens you can roll up and put in your pocket. The name comes from the use of “organic” semiconductors, which are made with materials based on carbon rather than silicon as in conventional electronics. And while optoelectronic skins are still being developed – organic electronics are already changing the technology we buy. Organic semiconductor materials typically come in two forms: as a small molecule consisting of a few tens or hundreds of atoms, or as long chains of thousands of repeating molecules (a plastic). The latter is particularly interesting, because we don’t normally think of plastics as conductors of electricity. But during the 1970s researchers realised they could make some plastics act as conductors, and some as semiconductors (which conduct electricity only under certain conditions). For many years the electrical performance of semiconducting plastics and small molecules has lagged behind the inorganic (non-carbon based) semiconductors that underlie many of our modern computer chips. But thanks to continued research and development there are now organic semiconductors with good enough performance that they are starting to be commercialised in new and exciting applications. The chemistry of organic semiconductors can be modified in ways that are impossible with materials such as silicon. Organic semiconductors can be made to be soluble, and can be turned into an ink. This means it’s possible to print electronic circuits, with the potential to manufacture components as fast as printing newspapers. And because they’re based on plastic materials, these circuits can also be made flexible and so no longer need to sit inside rigid boxes. Here are three ways organic electronics are already altering the way we use technology. Organic light-emitting diodes (OLEDs) are the big success story of organic electronics so far, and you may already use them as part of OLED displays in some high-end TVs and smartphones. They are now being considered as a new way to light homes. OLEDs are effectively a sandwich of one or more organic semiconductors in between layers that allow different electrical charges into the semiconductor. As charges meet in the middle of the sandwich, they combine together to give out light . Unlike inorganic light-emitting diodes, an OLED light can be made on large plastic sheets. This means you could use OLEDs as flexible light-emitting surfaces to create new ways of lighting rooms , that aren’t reliant on point sources such as bulbs. Another application for OLEDs are in displays. They are particularly popular with TV manufacturers because they generate light directly and so don’t need the white backlight and filters that are found in other technologies, meaning the overall display can be thinner. They also open the possibility of making flexible displays and several electronics manufacturers are expected to launch bendable products in the next few years, although this is not without its challenges . Flexible displays rely upon electronic switches known as transistors. These organic field-effect transistors (OFETs) are also made from organic semiconductors. Behind each OLED pixel in the display is an OFET, ready to turn it on and off as required. OFETs work by having three electrical connections: the gate, source and drain. A voltage applied to the gate makes the semiconductor either more or less conductive. This either allows or prevents electrical current from flowing between the source and drain. Just as organic electronics can be used to generate light, they can also convert light into electricity when used in solar panels. Organic photovoltaics (OPVs) have a very similar structure to OLEDs and can do the same job as the silicon-based solar panels already used across the world. The key difference is that they can be made rapidly on thin plastic sheets using established printing processes. As well as reducing manufacturing costs, this means you could stick them to virtually any surface or object for a ready-made source of power. Although organic photovoltaics aren’t currently as efficient at generating electricity as conventional solar panels, their performance has been steadily increasing over the past decade . However there are still significant research efforts and there are a number of companies already developing and selling panels. While these advances are already happening, there is a far wider range of potential uses for organic electronics. 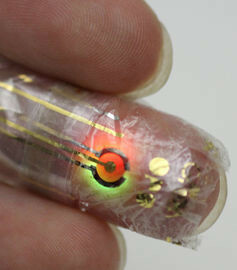 From the University of Tokyo’s electronic plasters for health monitoring to biodegradable gadgets , these materials promise an exciting future of new technologies.